"Aquatica Plus UK ships Blagdon Affinity Inpond Foam Set from Amazon.co.uk. Amazon.co.uk has fast shipping in the UK and often free shipping on pond and aquarium supplies. Add to your basket now while supplies last to avoid delays." 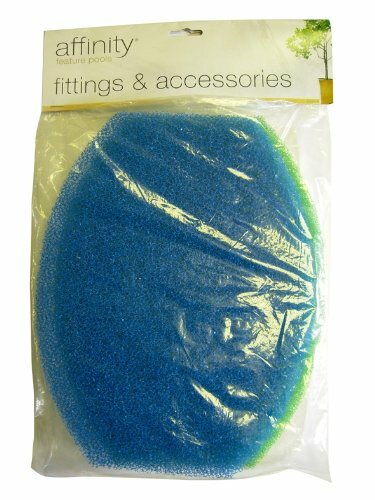 Blagdon Inpond Spare Foam SetThe Blagdon Inpond Foam set is a replaceable filter foam set which is for the in pond all-in-one 1400, affinity all-in-one 1400 and four-in-one 1450 filters. Removes even the smallest dirt particles to ensure crystal clear water. Change whenever the pool looses sparkling clarity, or when you clean your Inpond. What customers say about Blagdon Affinity Inpond Foam Set? Excellent product. Helped clean my pond but its hard work having to lift the pump and filters out every week or so. The filters are doing their job well because the pond has been left for just over a year and was full of leaves etc and one could not see the fish. NOW THE POND IS CLEAR AND WE CAN SEE FISH AND PLANTS. RECOMMENDED ITEM. GOOD QUICK DELIVERY EASILY WASHABLE.